I get things into my head that certain projects need to get accomplished – and it happens at the most random times. It drives Aubrey nuts. But right before the Christmas rush for the shop, I felt that my studio didn’t really look right and the major problem was the worktable that I use. I never loved the wood tone of the Varde Island from Ikea but it was the right price, and, has served well. I’ve had this table since I started my shop in 2004 and it has been amazing. But the wood tone didn’t fit with the darker walnut tones in the floor and my DIY desk. So I took it upon myself to try to fix it, to fit more with my current style. I gave away the “after” above. They really are simple changes, but make a huge difference. To read more about how I did it, and, more shots of the space now, read more after the jump. Step 1: The first thing I did was pulled out my heavy duty sander that I used for this project. After 9 years of use the tabletop was worn, dirty and banged up. So I got my sanding on and sanded the wood block top a LOT. 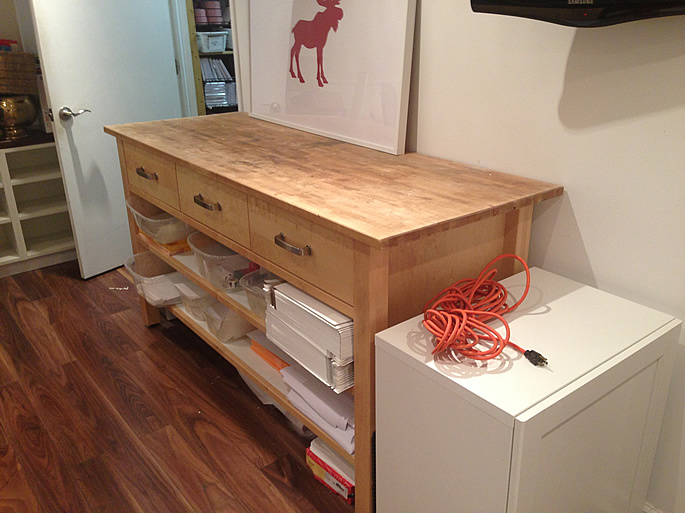 I then stained wood the exact same walnut tone as I did my DIY desk – so that it worked together more. Next, it was time to paint the laminate base. I took my time – first , sanding the laminate base with a fine grit sandpaper. Then I primed it, After priming it, I sanded it again lightly. The extra care in sanding between coats makes the paint smoother and gives a more professional look. Having a sander (I used my mouse sander for these steps) was key. After the primer, I painted the base in Benjamin Moore’s Stone Harbour, using their Advance line of paint. I installed a hook on one side of the table, to hang gift bags for the store. Friends in the area get personal deliveries, so instead of stacking these away, I used a hook that we had in storage and installed it on one side of the table. I’m really, really happy with how the studio is feeling now, the worktable now fitting in a lot more with the whole room. The back wall has the organizational shelves for orders, but we quickly grew out of that this year so we’re planning on eventually building a few more rows up. I’m determined to keep my office here at the house, as there is a comfort to being here for Oscar, and being able to work. So I’ll keep finding ways to modify my space to grow as the business does. Base Colour: Benjamin Moore’s Stone Harbour, using their Advance line of paint. Don’t Grow Up, It’s a Trap Art Print, The Penny Paper Co.